You might not immediately think "Tesco", when considering retailers which supply quality dark chocolate, but think again. The familiar family supermarket have released a range of dark chocolate bars, and they are too good to miss. Tesco recently sharpened up it's act with new additions to it's Finest range whereby every 'fine' item got re branded and polished with better typography and seemingly higher quality ingredients. That's the impression I got when I fingered the new wrapping of the Swiss chocolate 200g bar I found in the baking aisle. I carefully tore the muted silver foil to reveal a silky slab of dark chocolate which looked significantly better than the Finest range I tried months before. Aesthetics aside, I took a bite and it is every bit as wonderful as you might imagine. 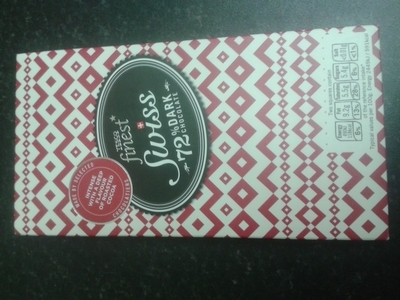 Switzerland is known for producing an outstanding level of chocolate, and Tesco have tapped into the secret. 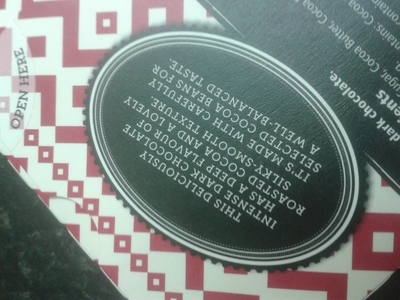 This bar is wonderfully smooth, rich, but not too deep in flavour. Unusually it has a creaminess, which I hadn't expected from dark chocolate, but I liked it. This chocolate is the perfect bar to break into hot chocolate, cakes, brownies or cookies because it lends a creaminess and yet rich cocoa flavour - perfect for chocolate fiends like myself. I have eaten it in its original bar form, but also added it to brownies and it makes them taste wonderful. 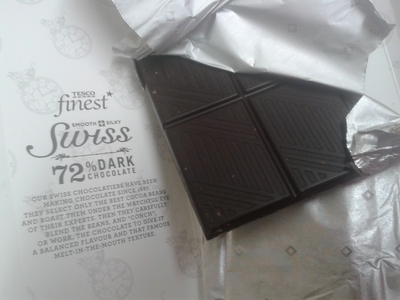 I hadn't quite anticipated the quality of this chocolate because Tesco is generally regarded as a budget supermarket which wouldn't normally match up to the standard of finer chocolatiers, but they have produced a bar which is quite wonderful. This particular bar tastes great with hazelnuts and pecans. This bar of Swiss chocolate costs £1.58 for 200g, which I think is quite reasonable considering bars of this quality can retail at a much higher price. I suggest buying more than one - you'll eat the first bar in no time.